On Saturday The Head of the River will come racing up the Thames. 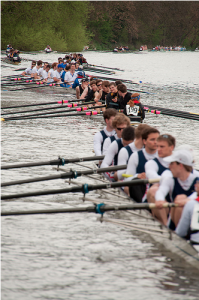 This annual event consists of around 3,500 participants bundled into over 400 boats, all rowing, at the same time, from Mortlake to Putney. It's a fantastic mess, with eight strapping men (and a little cox) in crews battling for 4.25 miles to be crowned the champions. The race looks like Waterworld meets lycra: boats everywhere you look. The Leander Club have won six of the last ten races, and because they were last year's victors they will lead off the race, keen to add another title to their trophy cabinet. The route passes along one of the most beautiful stretches of the river. To fully appreciate this why not cycle it yourself and try and keep up with the leaders? The path on the south side is excellent for bikes; twisting alongside the fantastically entitled Leg of Mutton Nature Reserve, through the London Wetland Centre, past the historic Harrods Depositary building, and culminating at Putney Bridge where a plethora of pubs await. The event starts at 11am so alternatively you could just set up camp at a watering hole and cheer the procession of crews chugging past. If the weather is good then expect the Thames to be teeming with people all eager for the best vantage point. Get yourself down there to enjoy a great start to St. Patrick's Day.